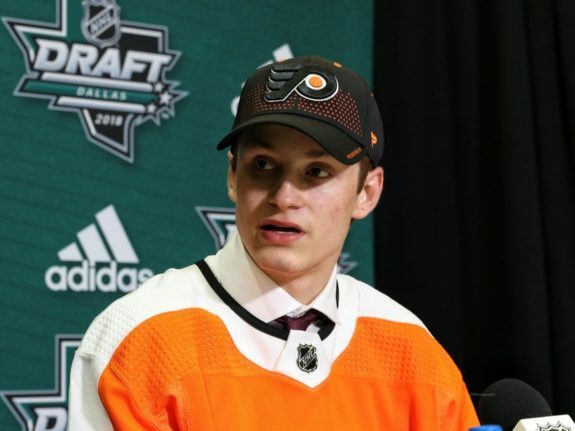 Last summer, the Philadelphia Flyers selected Joel Farabee 14th overall in the 2018 NHL Entry Draft. Now, less than a year later, they have signed the young winger to an entry-level contract. The contract comes into effect at the beginning of the 2019-20 campaign, meaning Farabee is not eligible to play in any of the Flyers’ games for the remainder of this season. However, he will be able to participate in the organization’s training camps this offseason. Despite being a freshman, Farabee was a powerhouse for the Boston University Terriers during the 2018-19 collegiate campaign. He led the team with 17 goals and 19 assists in 37 games. Five of his goals came on the power play and he is considered one of the top NHL prospects today. With his 6-foot-1, 170-pound frame he is able to fight through a crowd of opponents and force his way to the goal. Even if he comes face-to-face with a formidable defenseman, he still has the ability to skate around him with his tremendous speed. In fact, Farabee scored a chunk of his goals this season on the fly. He could often be seen galloping down the left wing before cutting in at the top of the face-off circle and rifling a wrist shot. It’s that physicality that set him apart at the college level. He has the attributes of a new era power forward: a compact frame and speedy, but still capable of doing the dirty work in front of the net to earn goals. What’s most impressive about this winger is his strong defensive game at such a young age. 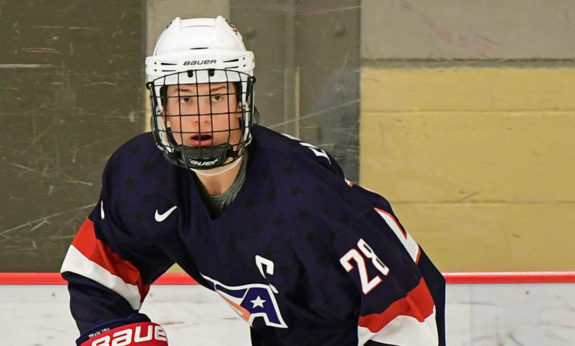 Most forward prospects have to develop their two-way game at the professional level, but Farabee is far ahead in this regard. The number of times he thwarted his opponent’s attempt at a clean transition through the neutral zone is astonishing and he can often be seen picking off a pass at his blue line and turning it into a scoring chance for his team. Farabee was also trusted on the penalty kill this season, leading to three shorthanded goals. In fact, his first NCAA goal was an unassisted tally while down a man. BU’s best forward during the 2018-19 season has also played at the international level, most recently representing Team USA in the 2019 World Junior Championships where he registered three goals and two assists in seven games, helping his country take home a silver medal. Whenever he stepped off the bench for a shift in his Terriers sweater, you could sense that the Hockey East Rookie of the Year was one of the best players on the ice. Stats and accolades aside, Farabee is a forward who can take control of a game at a moment’s notice. He will be quite the threat at the NHL level.